I do not presently have a Second Life. But someday, who knows, I may need it. I can certainly understand the artistic and narrative appeal of a virtual world where everything is as beautiful as you want it to be, and you can unleash your inner fantasy self. 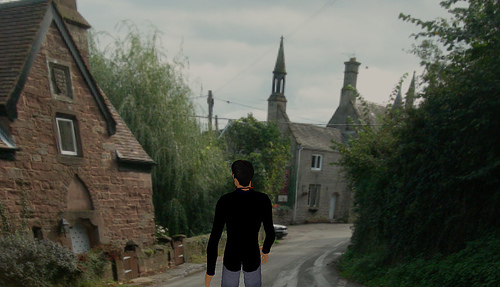 What I like about the idea of Second Life is that it is a perfect metaphor for my notions of reality (this reality). I firmly believe I am merely an avatar. And the absorption of this-reality people in the virtual one shows why it's easy for an avatar to become so wrapped up in one world that the other disappears from consciousness. I know there are people who are baffled by it, but I can understand how some people could easily become absorbed in an existence where it's never necessary to be lonely and where you can be who you want to be....Second Life is a sort of masqued ball or carnival (and human beings have always loved the freedom that comes from putting on a mask). 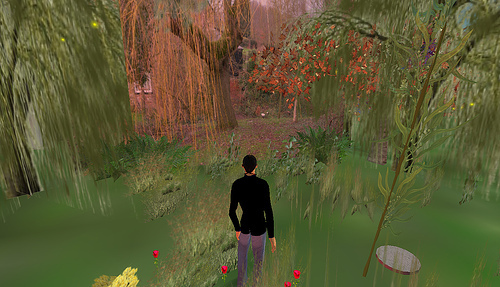 For a wonderful explanation of Second Life, read this one by Thaumata Strangelove. Anyway, say whatever you like, all of the following qualify in my book as art. They are filled with color, poetry, and human ingenuity. 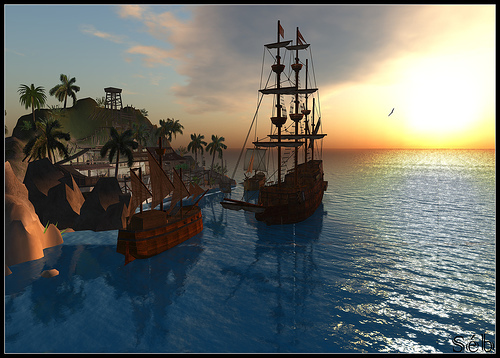 (1) "My Second Life" by Victor Keegan | To view a full-sized version at Flickr, click here. I do not own the rights to this photo/work of art, but am using it in compliance with a Creative Commons license. Please do not save or download it without first consulting the terms of the applicable license. The license is here. (2) "Avatart" by Victor Keegan |To view a full-sized image at Flickr, click here. PHOTOGRAPHS BY FLORENCE BANBENCO. I asked---and received---permission from the woman who photographed these next two beautiful virtual landscapes. 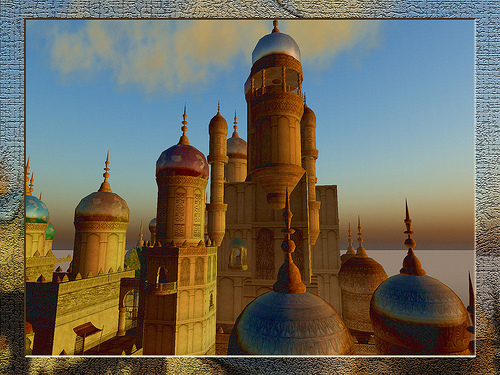 She graciously allowed it, as one of her aims is to promote the beauties of Second Life. I do not own the rights to this photo/work of art, but am using it with the written permission of the owner. Please do not save or use it without obtaining her permission. You are privileged to see this next photograph---she now has it set only for private viewing. Can you not see why someone would wish to step inside it? 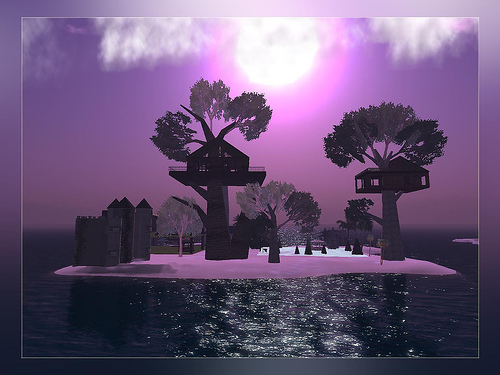 (4) "Une ile dans Second Life" by Florence Babenco [used by PERMISSION ONLY]. PHOTOGRAPHS BY DENZEL BABII (NIGHTHAWKS24). Night-Hawk is a professional Second Life photographer who has photographed many Second Life landscapes. Here is a sampling of some of his glorious compositions. (5) Svarga-24 by Denzel Babii (Nighthawks24) | To view the full-sized image at Flickr, click here. 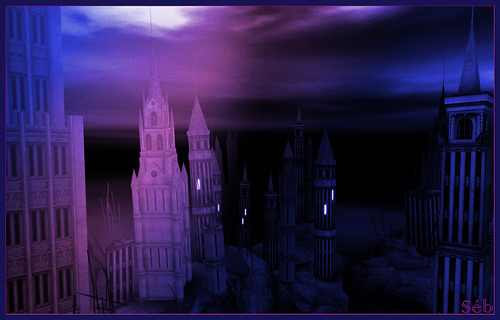 (6) "Elim-Windlight Blue" by Denzel Babii (Nighthawks24) | To view the full-sized image at Flickr, click here. PHOTOGRAPHS BY SEBCAEN ULYSSES. 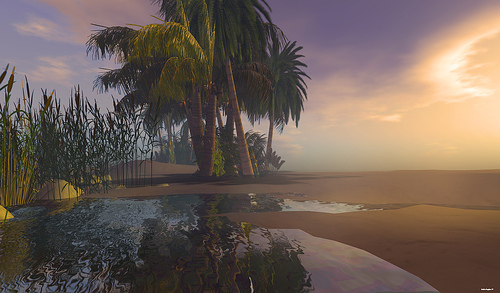 Seb is another avid photographer who wishes to highlight the beautiful landscapes of Second Life. He generously told me to use any of his I wished. So I took four! 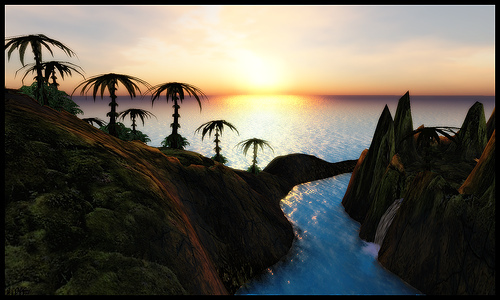 (7) "The Seabreeze--Windlight" by Sebcaen Ulysses | To view the full-sized image at Flickr, click here. (8) "Huahine"by Sebcaen Ulysses. To view the full-sized image at Flickr, click here. (10) "Postcard from Huahine 3" by Sebcaen Ulysses. | To see full-sized image at Flickr, click here. PHOTOGRAPHS BY DEEDEE DEEPDENE. You know I loved DeeDee Deepdene's photographs---these remind me of an idealized and primeval Florida! (11) "Deepwater Dawn" by DeeDee Deepdene. To see full-sized image at Flickr, click here. (12) "Dee Dee---Deepwater" by DeeDee Deepdene. To see full-sized image at Flickr, click here. 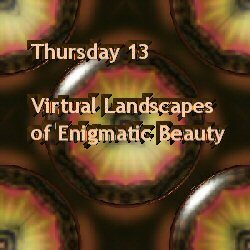 (13) After so much virtual beauty, my 13th is a sad one. Sadly, Second Life has billboard problems. Click on "Land Spammers" by Ms. Strangelove | website: thaumata's blog of ill repute | Let's hope the virtual people manage to find a way to pass some virtual land use ordinances. ...the rest is still unwritten! I especially like the DeeDee pics! It's been quite a while since I visited SL. Thanks for reminding me! My TT gives you 13 quotes by His Holiness the Dalai Lama. These really are amazing. They are fantastic in the true sense of the word. Makes me long for daylight so I can look again at the real thing. Thanks for an interesting post. Wow, they're very surreal and very beautiful. Wonderful pictures! Those really are amazing. I'm not sure I get the whole SL concept, but that's okay for now. The pictures you posted are speaking to me; they are calm and restful and simply amazing. Those are great....its amazing how far we have come in graphics:) Happy TT. Great stuff. I was totally surprised and pleased to see a different side of you. Beautiful pics from SL! I'm amazed at the places folks can come up with and create in there. I agree about the whole avatars getting so wrapped up in one world that it causes a bit of reality distortion/confusion. Good idea for a TT! I am so finding a way to get myself to an over-water bungalo in Tahiti. Like a window into another world.Thanks for the beauty. I really REALLY love #s 11 and 12!!! My 13 is all about the Chinese New Year that begins today. Come see which symbol you are. I love visitors. I enjoyed looking at these pictures. #1 reminded me of the movie What Dreams May Come. 4 & 7 & 9 really grabbed me, I loved this. Second Life featured big on a CSI: New York episode earlier this year, the video game, so this is an interesting concept. Great TT theme. Wow, these are pretty amazing! Happy TT! I feel so ignorant right now... I've heard of Second Life, but have never checked it out and don't really know what possibilities if offers. So yes, these a pretty pictures of course, but I have no reference points for them. Interesting topic. Happy TT! These are lovely indeed. I've never heard of Second Life ... but enjoyed seeing the pictures. Thanks for sharing. My faveorite is number 9. It's beautiful. Those are beautiful pictures. Some are so realistic that they look more like photographs than cartoons. I have been into Second Life but somehow I haven't found the attraction. I prefer to see the sights this way than by actually visiting. Oh, I love these. But you visited me, so you know I love rich color. Just beautiful. #3 Orient is my favorite... I love fantastical architecture. Fun. So glad I came by.